A lot of people may not know that NUI Galway has its own literary journal. Every year, MA students in Literature and Publishing produce ROPES (Review of Post – Graduate English Studies), which first launched 26 years ago. Originally, the journal mainly published critical essays which reflected on Irish literature and culture. Now poetry and prose, fiction and non – fiction can be found amongst its pages. Usually each edition of ROPES has a theme. Sparks, Independence, Coming of Age or Change have been the focus of previous editions. The big change with the journal this year is that submissions are not restricted to any particular topic. Instead the focus of this year’s team is to open up literary space for a more diverse collection of writers which express their world view from their unique perspectives. The topics may range from political to personal issues. The literary forms accepted by ROPES are also varied. Poetry, prose, script, song lyrics amongst others are all welcome. As well as that, the journal also accepts visual submissions such as artwork, photographs or comic strips. Another feature of ROPES is that each year the proceeds from the journal are given to a chosen charity. In 2016, the journal collaborated with Jigsaw Galway. This year, it is Galway Simon Community which deals with homelessness. As Ireland is in the throes of a housing and homelessness crisis, Simon Community was the obvious choice. 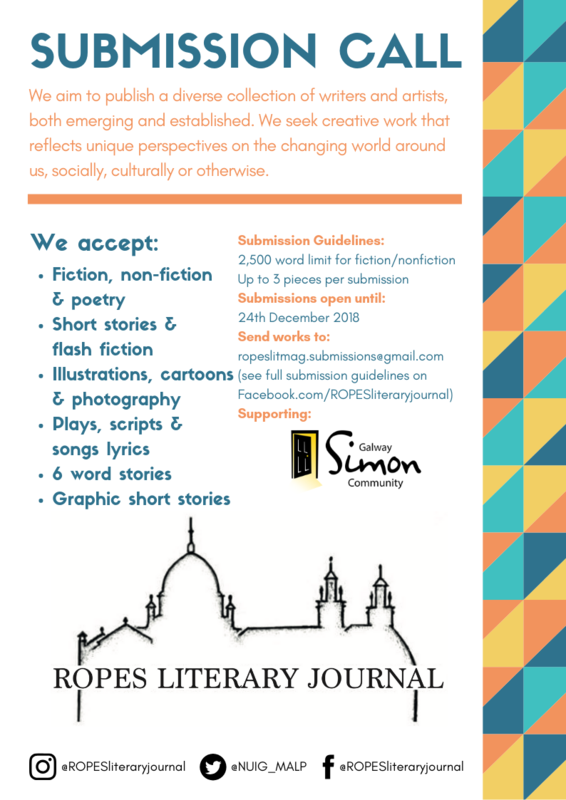 At the moment the ROPES team is busy with reaching out to writers and collecting material for publication. The journal will launch in April during Cuirt International Literary Festival, an important literary event in Galway. Everyone at ROPES will have their hands full until then. Submissions are now open until 24 December for written material, whereas the deadline for visual works is until 24 February.